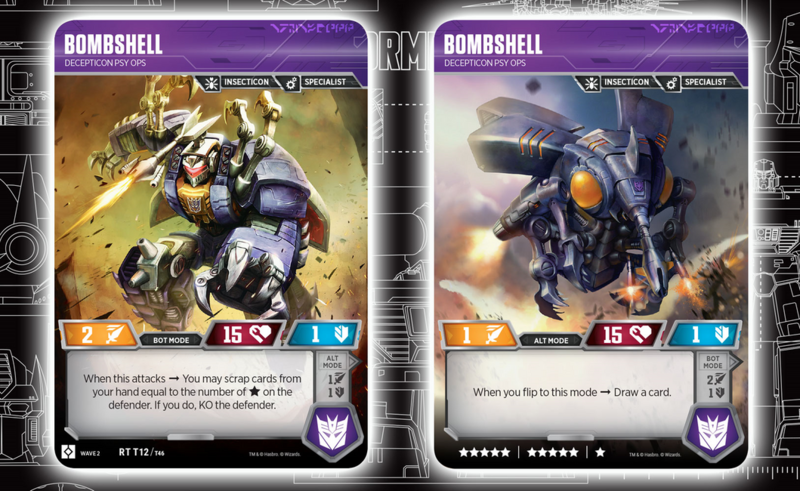 Care of Vector Sigma Website, we can share for you the Transformers TCG Bombshell Psy Ops Card. This card is also part of the Rise Of The Combiners Booster Pack. Bombshell has got some very interesting effects and it will sure be useful in a well-built deck. When attacking, you can scrap cards from your hand equal to the number of stars on the defender and get an instant KO. Additionally, when you flip your card into insect mode, you can draw an additional card. It will be interesting to see this against Shockwave. Someone using this to build a hand before Shockwave flips and does a lot of damage. Against? I was thinking with. Two characters that are draw engines, both punish the opponents by use of card discard. Oh I super dig that. Maybe Bombshell and Shockwave with good draw can eat through Stunticons? Motormasters ability doesn't matter right, you're not dealing damage, just KO'ing. Cool ability. You could put him and Sunstorm together with lots of draw cards for some fun. Kind of a bummer to get yet another repeat so soon though.